Covered calls are an example of positions that are short volatility. I hadn’t thought of it that way until Sheldon Natenburg, the author of Option Volatility & Pricing pointed that out in a fascinating interview in Expiring Monthly (http://tinyurl.com/6wwplf9). A covered call position is profitable if the underlying equity stays the same or goes up, but in a big market downswing, when volatility spikes up, the modest potential profits from a covered call are more than wiped out by the losses in the underlying. 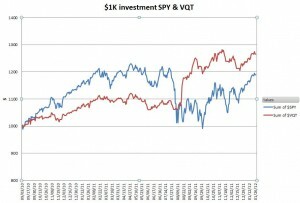 Unfortunately it is usually expensive to hedge a short volatility position. The two most common strategies have problems: VXX typically has roll yield losses, and VIX/VXX options have significant time decay. Recently I started looking at Barclays’ VQT ETN, a fund that is intended to be long volatility. 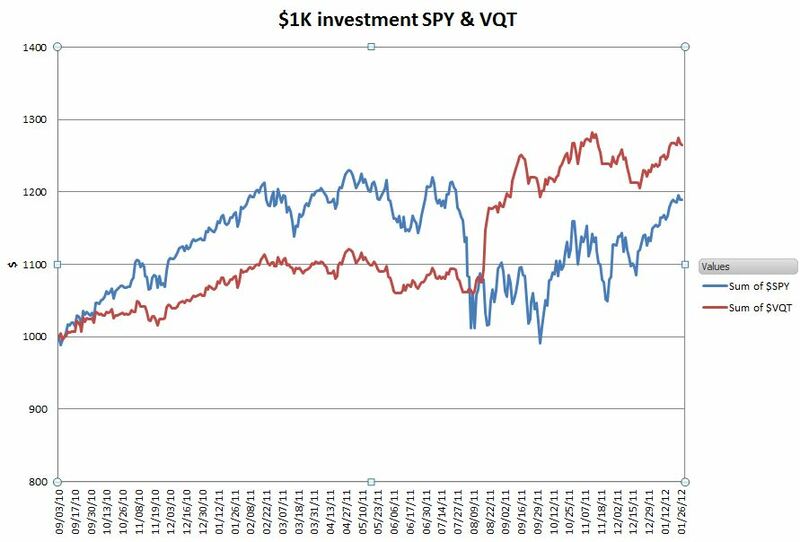 The chart below compares $1000 invested in SPY and VQT starting in September 3rd, 2010—VQT inception date. 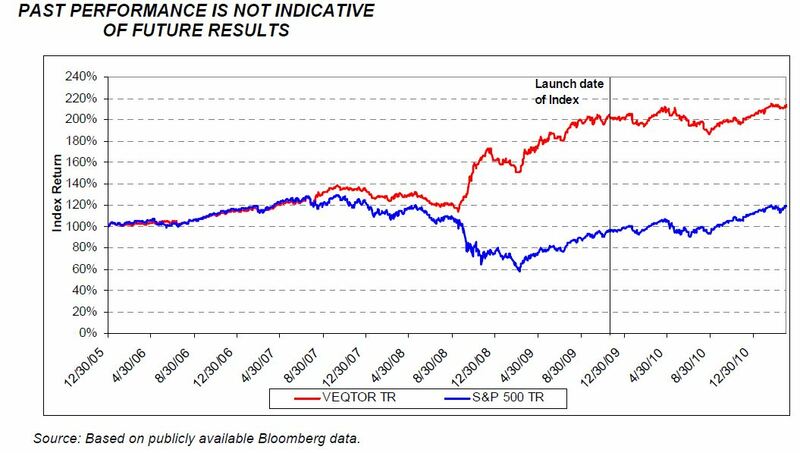 In bull market phases VQT underperformed the S&P 500 by about 50%, but during the -19.5% drawdown in August 2011 VQT only dropped 3% before going on a short term volatility fueled binge that lifted it 20%. 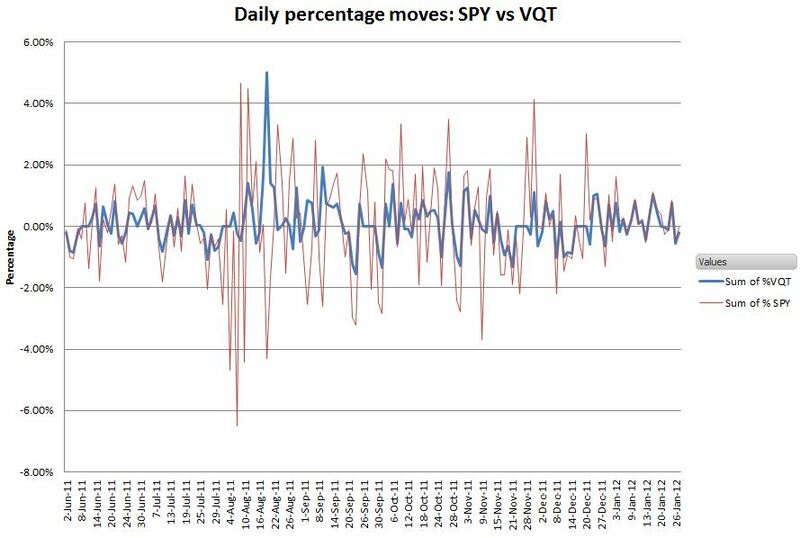 The next chart shows the day-to-day percentage moves of VQT vs SPY since June 2011. VQT looks almost tailor-made for covered call writing. 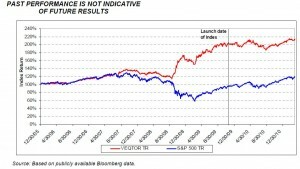 Its low drawdown behavior limits capital risk while its volatility is similar to the S&P 500. Unfortunately, there are no liquid options available on VQT, so we’ll have to get creative in developing a covered call style position. 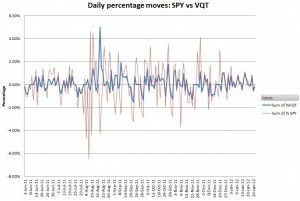 Since much of VQT’s composition is direct exposure to the S&P 500 I will use SPY options as logical building blocks. A covered call is a short call position hedged with a long equity position. Since brokers won’t accept a long VQT position as a hedge for a short SPY call and I don’t want to have naked calls, I’ll protect my short call position with long out-of-the-money calls—creating a call spread. I’m not too concerned about losses on these credit spreads, because VQT is a natural hedge for the position, so I’m comfortable with a $2 spread in the option strike prices. The spreadsheet that provides the VQT backtest data from March 2004, including all formulas is available here. How Do VQT and PHDG Work?